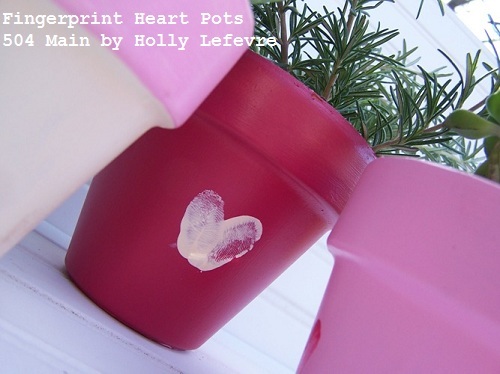 I made these sweet pots years ago, and they are still my absolute favorite holiday craft EVER. Every time I see my babies sweet little fingerprints as hearts, my heart melts. They are so easy to make. And just put a special someone's favorite plant in them and you have the perfect heartfelt Valentines gift! I happen to love mine so much, that I always have my pots out on display! I am obsessed with a lot of things lately...but when it comes to gifts..live plants have stolen my heart: succulents, mini herbs, miniature roses, ornamental grasses - I am not picky...I love it! And I have quite a few gifts to give...so I need a sweet planter right? 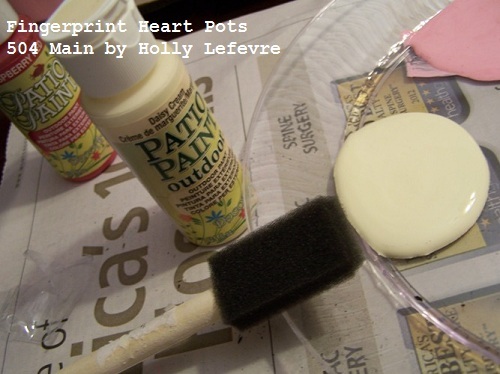 I love using DecoArt Patio Paints on my pots and outdoor signs. Terra cotta pots.I used small ones - 4" and 2", but any size will do. 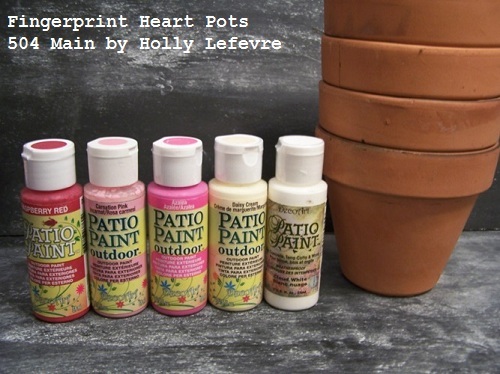 DecoArt Patio Paint: I used Raspberry Red, Daisy Cream, and Carnation Pink. 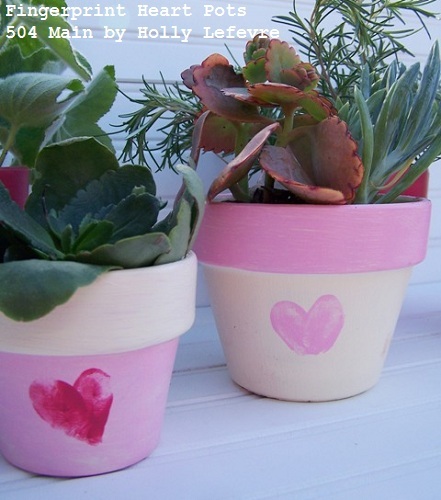 Paint each pot in your desired color. I used 2 coats for the Raspberry and 3 for the other lighter colors. Now, you can paint the rim with a contrasting paint. I did on some and did not on others, but because I used coordinating colors, they all work as a group. I also paint the inside of the rim (about 1"+ down) so that it looks pretty inside the pot. On a paper plate, place a small amount of paint. Gently dip a finger in the paint - you can use any finger...I find it easy to use the index finger and my pinky. Tap gently on the paper plate or paper towel to remove excessive paint - YOU MIGHT WANT TO PRACTICE ON SCRAP PAPER BEFORE YOU DO IT ON THE POT. At a slight angle press the finger on the pot. Re-dip the finger (if you need to) and press the finger to the pot, angling the opposite way BUT overlapping at the bottom. You can do a few hearts, one heart, or hearts all over. I made a few myself and then let the kids have at it! See. a cute and simple project that can be made in so many colors! 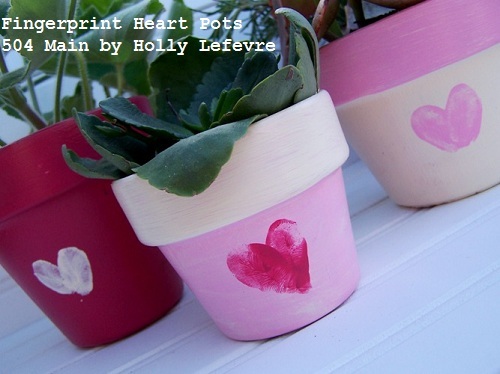 I enjoy making cards with my kids or for that matter in craft with them and they would love doing pots like this. These pots are really cute. This really is a "hands-on" project. Thanks for sharing this idea! favorite valentine treat is chocolate! My favorite Valentine craft is making my own Valentine cards. My favorite Valentine's day treats are the cards my kids make me. We have a lot of birthdays in our house this month too, Holly! I love these pots, great idea. I love Valentine chocolates best. Those pots are just too cute! I love anything with fingerprints or handprints! 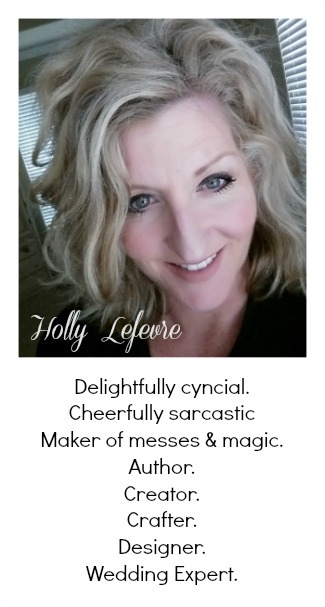 These are too sweet, Holly! 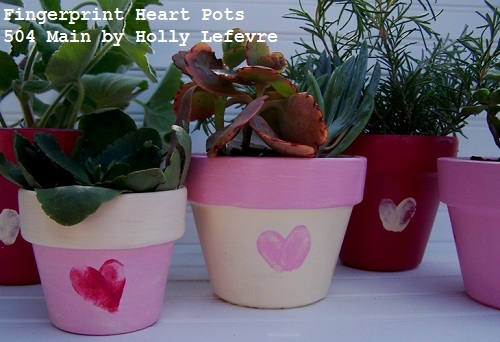 I need to make these heart pots with my boys. 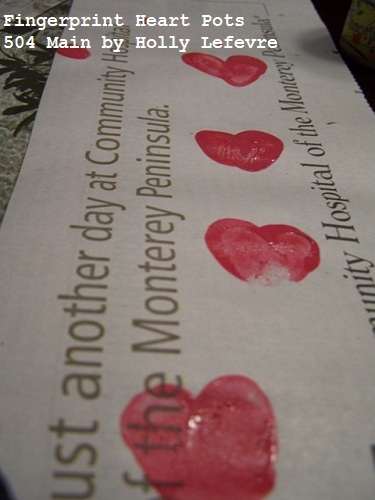 I my favorite Valentine craft making homemade cards. I remember doing that growing up and want to pass the tradition on to my boys! What a clever idea! Can't wait to do it with the grands. Tons of ideas to fill the pots with. Thanks for the inspiration! 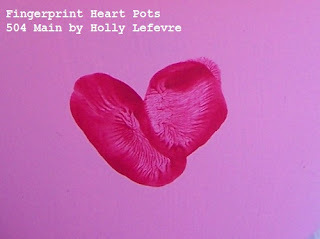 I love the vibrant pinks and the fingerprint heart is so precious! I just made a valentines "wreath" out of paint sticks and a chipboard "o". Hugs and Kisses. cute and free, as I had all of the supplies. I'm not too picky... anything involving chocolate works for me! Anything edible - cookies and treats! My favorite Valentine's treats: chocolate and craft supplies!